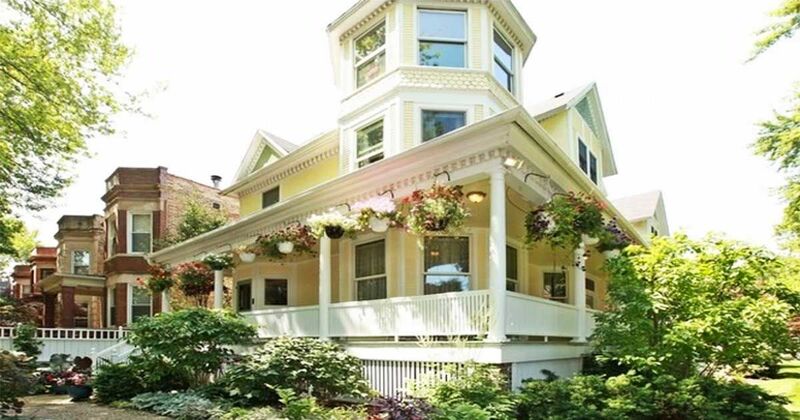 With a pale yellow paint job and a large wrap-around porch, this home looks like it just walked off an old movie set. 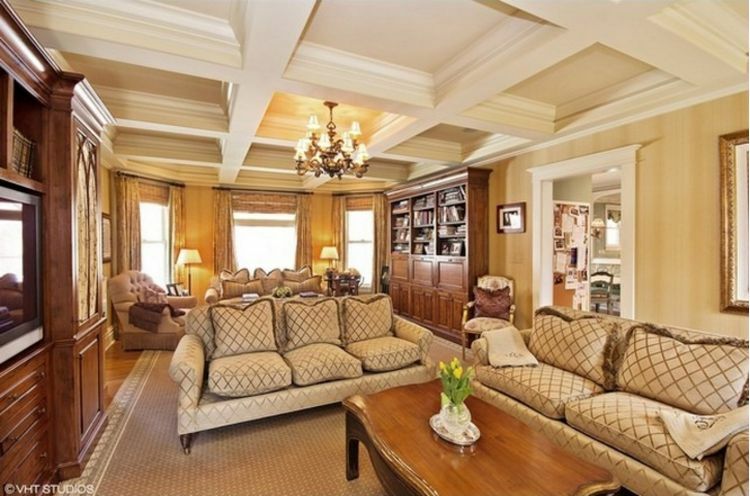 Located in Chicago, this 8,000-square-foot home has more than 20 rooms! This historic home was built in 1891 and features a beautiful backyard and three-car garage, according to RedFin. If the elegance of the home's exterior isn't enough to make you swoon, step through the front doors and take a tour through the well-maintained interior. 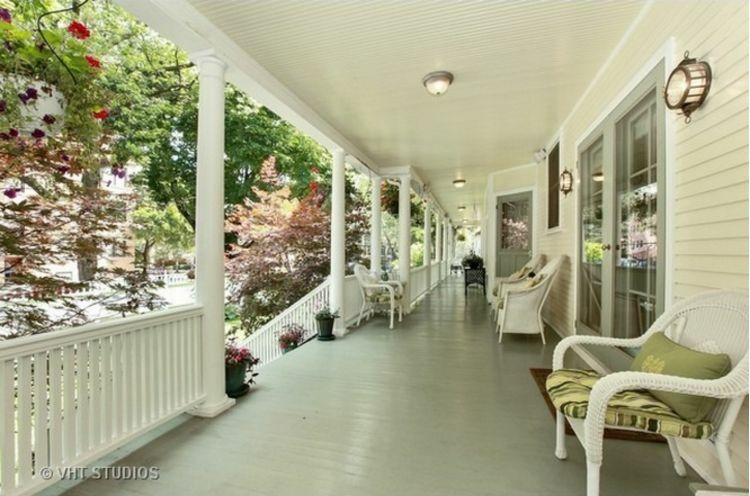 This large wrap-around porch features plenty of space for sitting and socializing. The covered area provides plenty of shade from the hot summer sun. 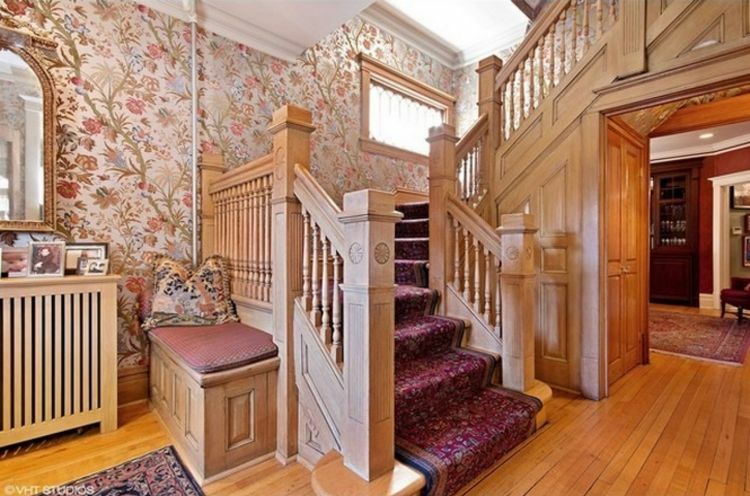 The large home features hard wood flooring throughout, and the beautiful stair railings are sturdy and detailed. Three large windows add plenty of natural lighting into this room, but the beautiful chandelier is the focal point of the sitting area. 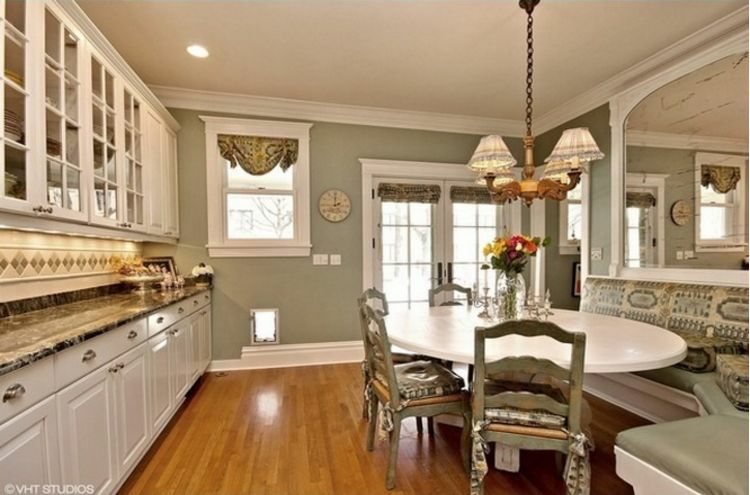 The comfortable formal dining room feels open because of bright window and two doorways entering the space. 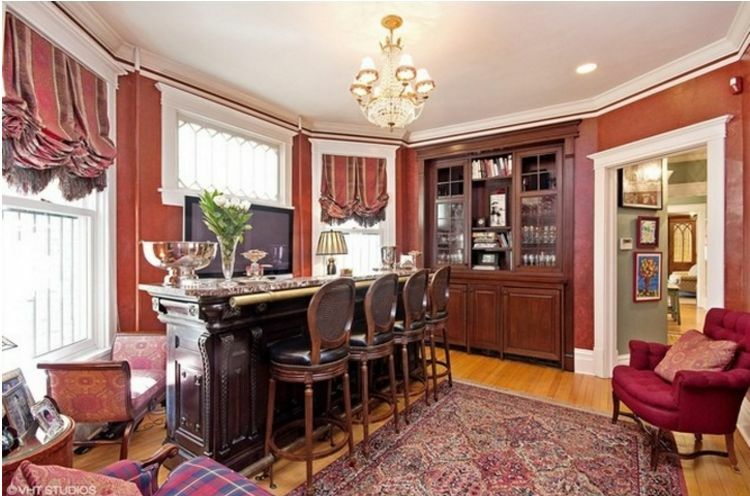 This bar room is an ideal place to visit with friends and family for a drink. The built-in cabinet provides plenty of storage, and the detailed windows keep this room from feeling dark and drab. The kitchen is comfortable. 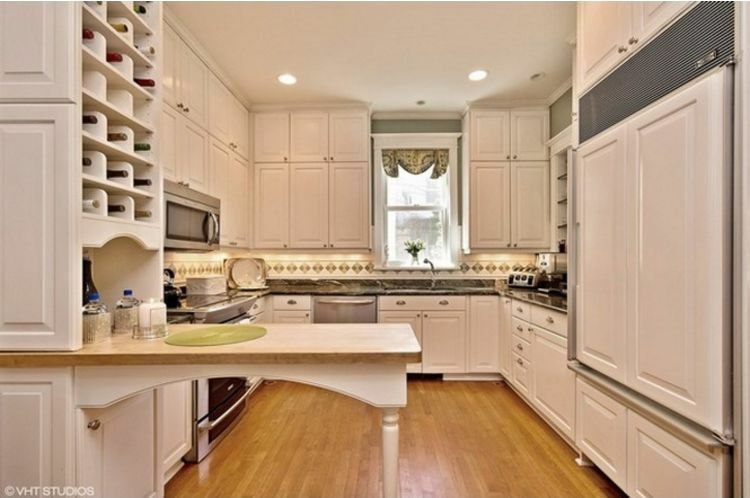 Modern appliances mingle with the vintage details of the home in the perfect way. A large built-in rack puts your favorite wine right at your fingertips, and there is plenty of counter and cupboard space. The other side of the kitchen offers a separate dining area and features additional storage and custom-built bench seating. This part of the home may feel more modern but doesn't take away from the Victorian architecture. 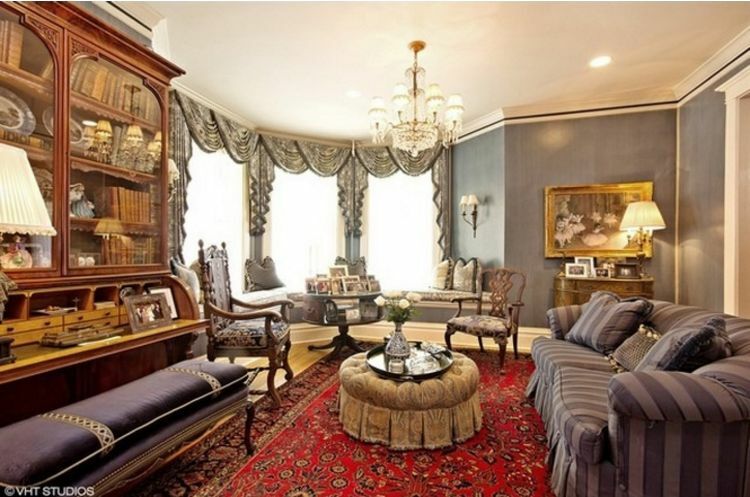 This comfortable sitting room includes large windows for plenty of light and beautiful decorative ceilings. The detailed ceiling is the selling feature in this room. 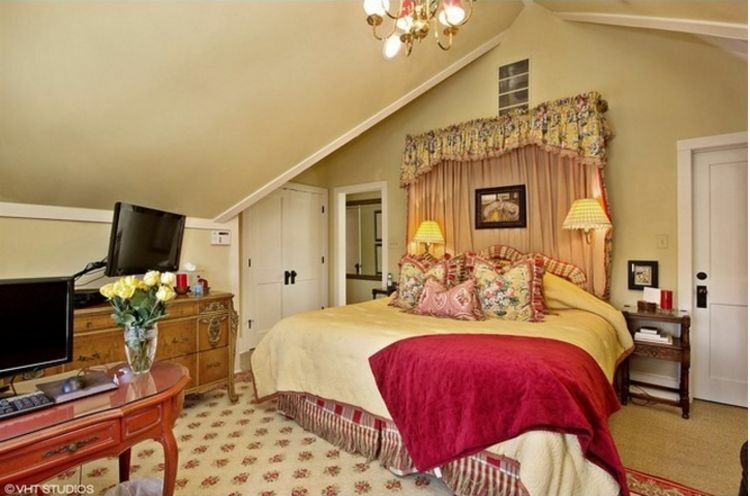 A massive master bedroom worthy of a queen features a fireplace, chandelier and space enough for a king-sized bed. Notice the outstanding and unique bench by the bed. 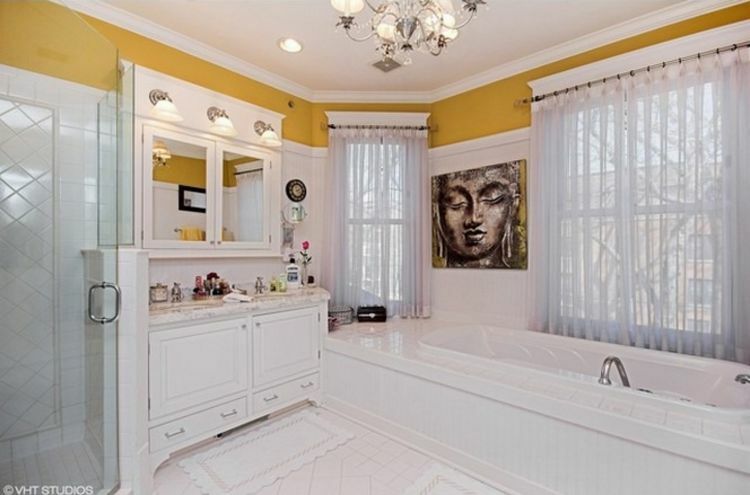 This is the master bath dreams are made of. A deep, jetted tub is surrounded by large windows, and the walk-in shower helps the bathroom feel open. The large vanity area has plenty of storage. There are several more bedrooms in the home. Each of them includes a large closet and plenty of space for bookshelves, desks and dressers. 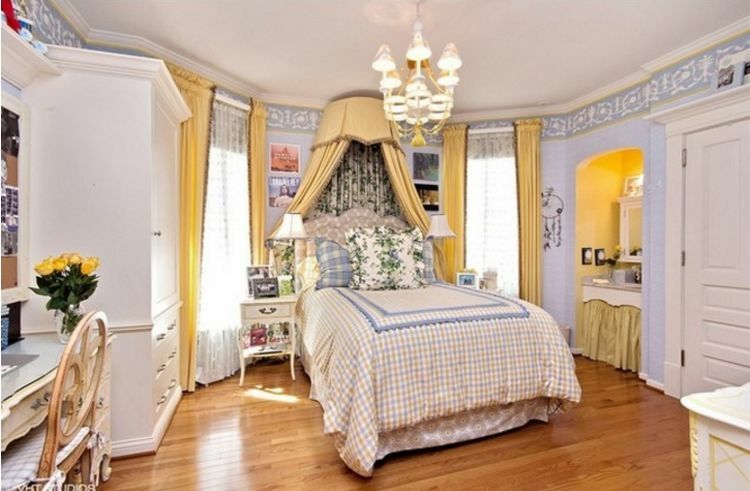 This bedroom is located near the top of the home. The dipped ceilings make the room feel a bit smaller, but it would make for a wonderful retreat at the end of the day. 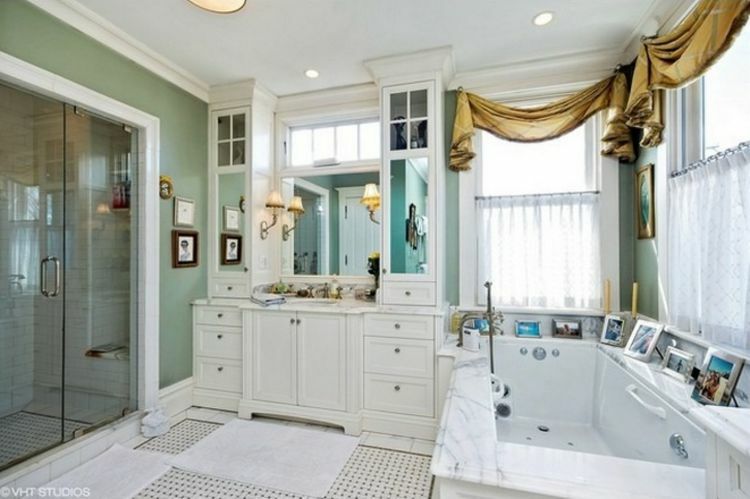 Another large bathroom features a similar design to the master bathroom. 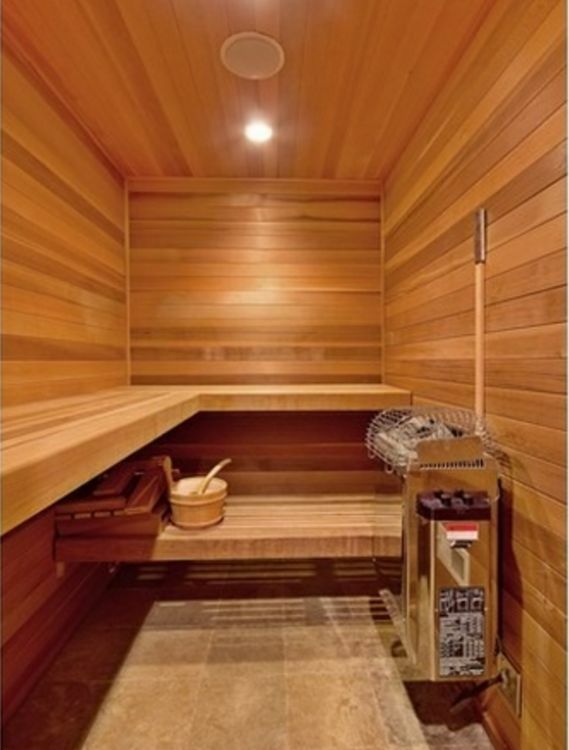 If you've had a really long day or an extra hard workout, relax in the in-home sauna! Now that's a great way to break a sweat. 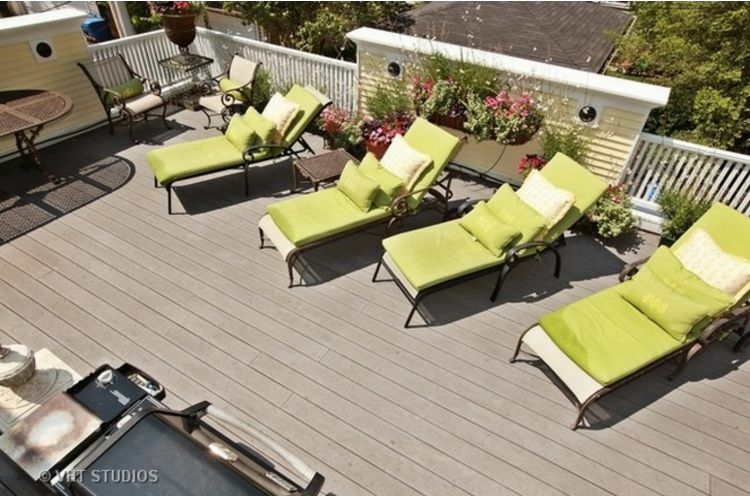 While the interior of the home is absolutely stunning, this private deck may be the tipping point that sends this home straight to perfection. 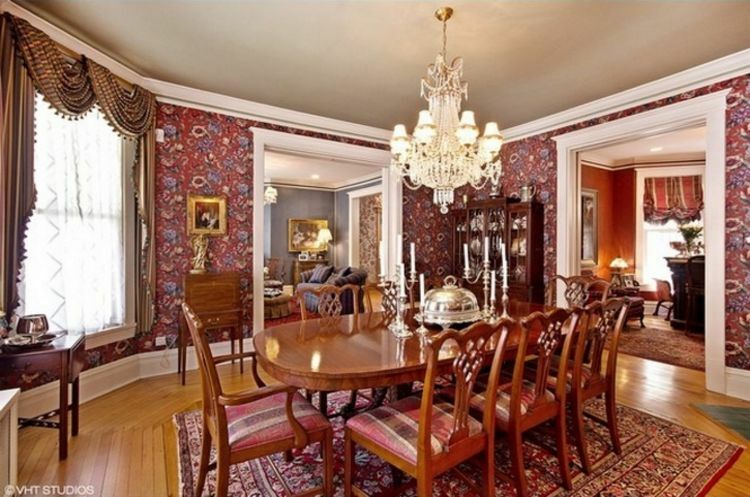 If you love this beautiful historical home, share it with your friends on Facebook.